Here we are, already half way through January 2017. Today one month ago I was officially done with all commissions and ready to take a break. Its been a month of absolute procrastination. I have not had the energy to get up early, or to even pick up a paintbrush. And did not feel ready for 2017. At some point I realized I needed to get a jump start. So today it happened. My canvas for my first official commission was delivered. I am very excited to get started. And after visiting my favorite gallery, I came back with a car full of canvas and a head full of ideas.Ready for 2017!!! Five years ago in 2012 I decided to take a leap of faith. Leaving behind a fixed income, stable work hours and fixed holidays. Scary step to take. And It was a step, not a leap. For the whole of the first year I was still permanently employed. During the second year I was only part-time employed. And the third year I was for the first time ever SELF EMPLOYED. Here I am 5 years later. Loving the decision that I made. Yes, I work hard. Yes, I am overly stressed at times. But I am fulfilled and less frustrated. Procrastination does become a problem at times. Looking for excuses not to sit in front of the easel does happen at times. Each year I am more stable, more determined to make this work. Since 2012 I have grown as an artist. There is a clear improvement in my work from 2012 to 2017. I am more confident in what I do. That unfortunately does not mean I don’t doubt what I do regularly, but rather less frequently. I walked blindly into a world I thought I knew. But soon realized I only knew it in theory. In some cases I (my art) was accepted and in certain instances I (my art) was rejected. Things I have to learn to cope with. Still today I am faced with many situations I am uncertain of handling. But by now I have a solid support system to turn to for assistance. Five years ago a gallery took a chance and included me in their New Signatures show. It has been such an amazing journey. I can not imagine my life without my Alice Art Gallery family. Now I can call myself an artist, a goal of mine since Grade 2. I don’t see it as luck but rather God guiding me on the path he had planned all the time. I am both nervous and excited for this year. I am ready to grow, to learn, to make. A new year filled with opportunity, waiting to happen. A new website, have a look, its beautifully done by a very skilled friend of ours. New clean canvas ready for a few layers oil paint! 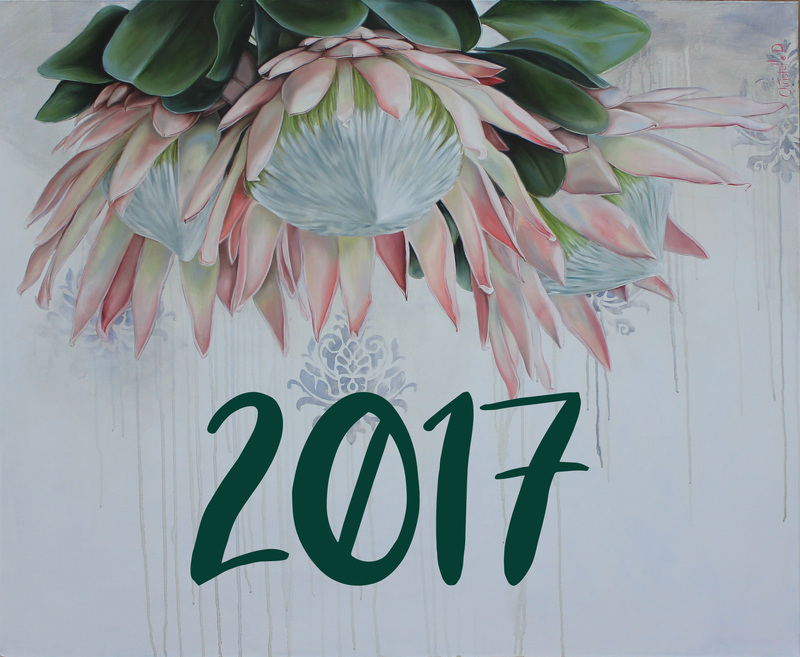 My first exhibition for 2017 will be at Alice Art Gallery in Ruimsig, and will take place 18-19 February 2017. Bied jy nog kunsklasse aan? My dogter is in gr 7. Ons woon in Randparkrif area. Kan jy asb inligting stuur? Goeie more Karen, Stuur asb vir my ‘n epos na christelledv@live.com en dan stuur ek vir jou die inligting met beskikbare dag.